Bryansk Engineering Plant (BMZ) has completed production of a pilot batch of 12-3090 model open car and has started its serial production. The plant has delivered the 2,000th open car to the customer, OAO HC Kuzbasrazresugol, having thus exhausted the production limit set by the pilot batch certificate obtained in June 2011. In May 2012 plant specialists conducted qualification testing of the open car and got a certificate of the Federal Railway Transport Certification Register permitting to launch serial production. In compliance with the above document, BMZ was qualified for production of open cars without quantity limitation till June 2014. Kuzbasrazresugol is the largest consumer of Bryansk open cars. It is expected to deliver 2,500 units to it this year. Last year the cars were delivered to OAO Electromed, Uchalinsky GOK and Kazakhstan Railways. 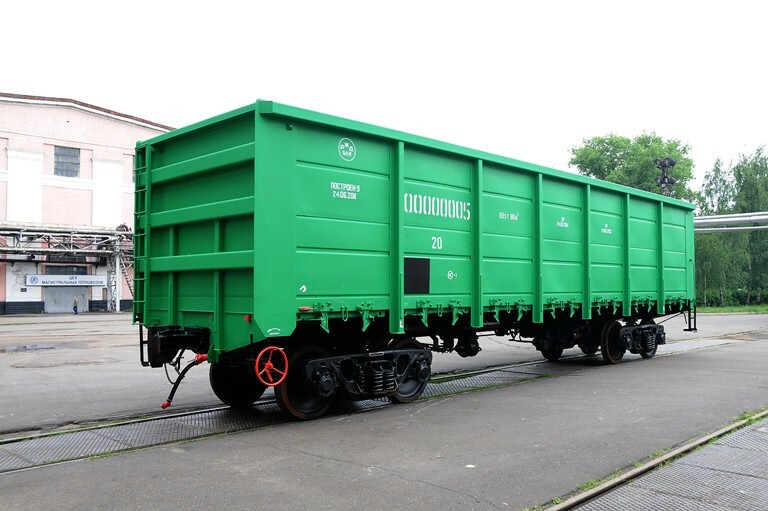 Four-axle universal open car of 12-3090 model, equipped with 14 hatches has cargo load of 69.5 tons, body space of 88 cubic meters and load per axle of 23.5 tons. Its design implies the possibility for further modernization: the car body can stand 25t load per axle. Strengthened top cord preventing from car body deformation during cargo handling operations is a design peculiarity of the open car. Fittings for slip joint of braking system piping and wheel saving asbestos-free pads are installed in the open car, thus, meeting requirements of RZD and improving wheels reliability. Upon customers’ requirement 12-3090 model may have wheel sets of enhanced hardness.